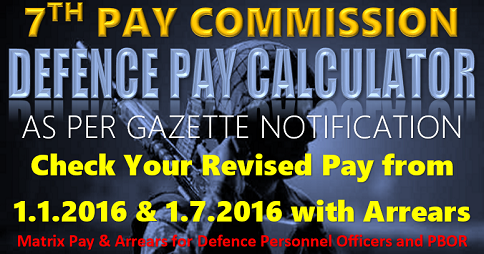 The 7th Pay Commission has recommended the fixation of pension for civil employees including CAPF personnel, who have retired before 01.01.2016, given two formulations with illustrations for fixing of pension. One for the pensioners retired before 2016 and another one is for the pensioners retired before 2006. And also recommended, the first formulation of fixing the pension may take a little time since the records of each pensioner will have to be checked to ascertain the number of increments earned in the retiring level. The first instance the revised pension may be calculated as in the second formulation and the same may be paid as an interim measure. In the event calculation as per the formulation of fixing the pension yields a higher amount the difference may be paid subsequently. And one more important recommendation of option given to the pensioners for choosing whichever is beneficial to them. 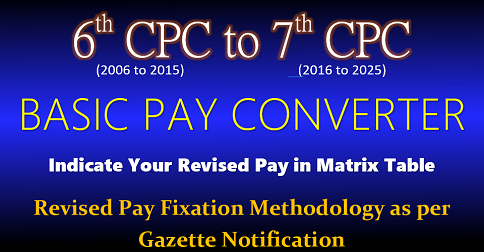 Recommendations on fixing of Pension by 7th CPC : All the civilian personnel including CAPF who retired prior to 01.01.2016 (expected date of implementation of the Seventh CPC recommendations) shall first be fixed in the Pay Matrix being recommended by this Commission, on the basis of the Pay Band and Grade Pay at which they retired, at the minimum of the corresponding level in the matrix. 1.This amount shall be raised, to arrive at the notional pay of the retiree, by adding the number of increments he/she had earned in that level while in service, at the rate of three percent. Fifty percent of the total amount so arrived at shall be the revised pension. 2. 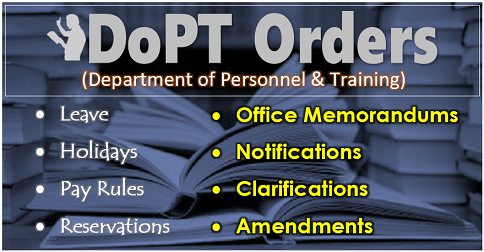 The second calculation to be carried out is as follows. The pension, as had been fixed at the time of implementation of the VI CPC recommendations, shall be multiplied by 2.57 to arrive at an alternate value for the revised pension. One of the biggest and familiar federation which is established in 1955, Bharat Pensiners Samaj (BPS) submitted a memorandum to 7th Pay Commission related to pensioners issue. The concept of minimum pension and the method of computing it have not been explained by any of the pay commissions or the Government, it is clear that the Minimum Pension is 50% of the Minimum Wage. The rationale behind the percentage has nowhere been explained. We however think that in order to ensure that it is adequate, 100% of the minimum wage should be the Minimum Pension. The very concept of Need Based Minimum Wage is that this is a level of wage below which a worker’s family cannot subsist / survive and remain capable to perform. That being the concept of minimum wage, it should also apply in the case of Minimum Pension on the premise that any pension lower than the Minimum pay is insufficient to enable a pensioner / family pensioner to live or survive. Common formula is : (Basic + D.A.) X Number of completed years of service X 15/26.. You have not mentioned you worked in Government service or private. if it is government, you can log on to http://www.pensionersportal & calculate. There is no O.M. for this. The revised gratuity (amendment) Act, 2018 brought in force on 29/3/2018. My father took voluntary retirement in 2004..He was working in Mumbai port trust. Now he gets total pension of 16313 rs.. in may he’ll complete 15years of restoration. What pension he should expect from may 2019. Minus his commuttation of monthly deduction plus 3% of D.R. of his pension amount. 50% of your last basic pay of Rs.31,100/- plus applicable D.R. Sir, I have retired on 31st July 2016 on basic pay 23800/=PB( 9300-34800) Go 4600/=with 33yrs qualifying service.Bank paying my pension as follow. Basic pension 11900/=Reduced pension 7140/=DR. 595/=+Med Allowance 1000/=total payable 8735/= Is it correct or something else. Kindly guide me. I was retired under superannuation on 30.06.2013. With last basic pay of Rs.17770/- pay of 9300-34800 -GPS 4200. My pension was fixed at the retirement is 8885/- on 6th CPC. 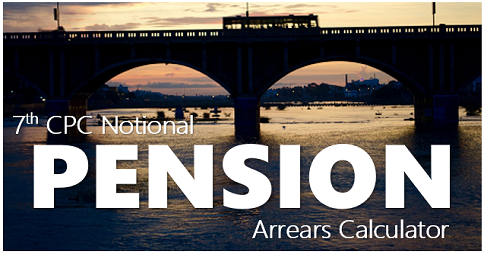 what will be my actual pension will be fixed?what will be arrears accumulated? kindly help me out please. My father in law retired from the post of District Education Officer Faridabad in Haryana in December 2003. His basic pay at that time was Rs. 10975/-. I don’t know scale of District Education Officer at that time. But his pension on December 2015 was Rs. 12404/-. What would be his pension on 1.1.2016. and pension on 1.9.2017 . What about pension for persons who retired in 2017. When is the revised pension been given as per 7 cpc. 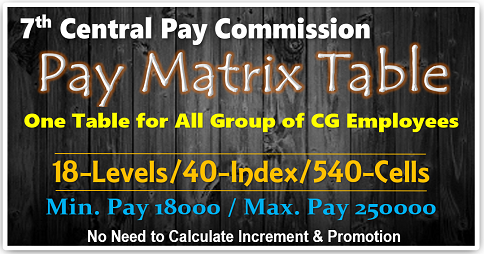 My basic pay in the pay scale of 14300-400-18300 under 5th pay commission was Rs.16, 700/- (with 6 increments). My basic pay fixed in the PB-4 pay scale of 37400-67000 was Rs.49, 590/-, in effect considered only 3 increments as against 6 increments I earned. 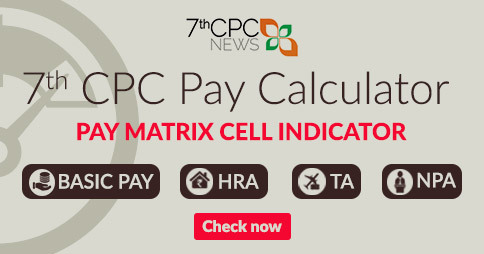 As per option -1, my basic pay under 7th Pay Commission is likely to be fixed at Rs.65,300 /- based on revised ‘ Index of Rationalisation’ for Level 13 Pay Matrix with enhancement from 2.57 to 2.67. , thereby, in effect allowing only 2 increments as against 3 considered under 6th. CPC vide level -13, row -3. If not 6 increments, at least 3 increments as considered under the 6th. CPC shall have to be considered. 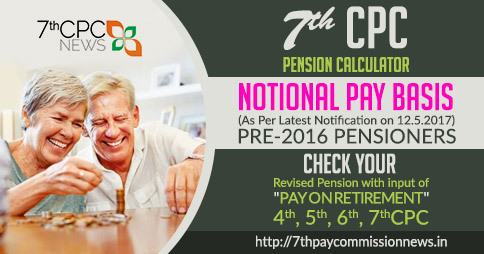 In other words, the revised basic pension, that is applicable with effect from Jan 01, 2016, as per Index 4 for level 13 of the revised pay matrix shall be 67,250/. I plead that the authorities concerned may kindly take note of the said inconsistencies in pay and pension fixation and take necessary corrective action in the pay and pension fixation. I ALSO RETIRED IN THE SAME SCALE 14800-18300 WITH 3 INCREMENTS ON 31/10/2003 AND I HAVE NOT BEEN GIVEN ANY INCREMENT WHILE FIXING MY PENSION AS ON I/I/2016 I WAS GRANTED PENSION OF 61550 ( 50% of min pay in the scale I plead that the authorities concerned may kindly take note of the said inconsistencies in pay and pension fixation and take necessary corrective action in the pay and pension fixation.